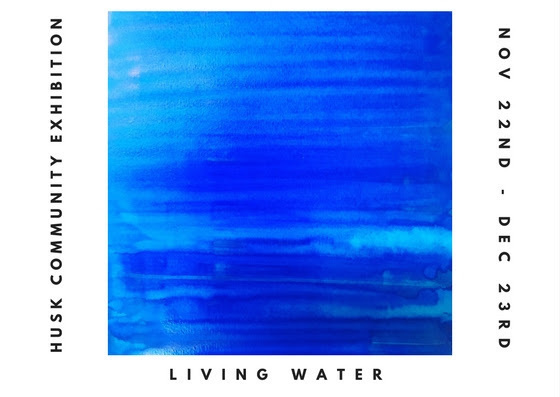 As part of their Christmas celebrations HUSK the Coffee and Creative Space in Limehouse East London are hosting a community exhibition on the theme of Living Water. Local artists, including myself, have been invited to show works in response to the question: What does water mean to you? There's a wide range of artworks and styles on display including paintings, illustrations, photographs, and poetry. Plus a thematic installation designed and made by the HUSK creative team and members of the regular art group. I'm pleased to be contributing the series of photographs and short poem shown below. As a photographer living in London I have long been drawn to the dynamic relationship between nature and the city. Water, light, and life are essential ingredients of any city and my work is a celebration of all three. The images were taken at wintertime on the canals of Little Venice in Maida Vale, London. A word of thanks to my friend and fellow artist/photographer Peter Lanes who accompanied me on our regular photo shoots that came to be known as the HUSK walks. Together we have embarked on many journeys using the cafe as our meeting place and point of departure, it's fitting and gratifying to share something of these experiences on the walls of HUSK. Special thanks to Kylie, Lulu, and Kirsty for your continual guidance, support, and inspiration. And to all the dedicated people at HUSK that help to make these projects possible. Over 50 artists are showing their artworks in a new exhibition starting today at the homeless charity Crisis's Bermondsey Project Space, London. It coincides with shocking news of a 23% rise in official figures for rough sleeping indicating the tip of a deep and growing homelessness problem throughout the UK. 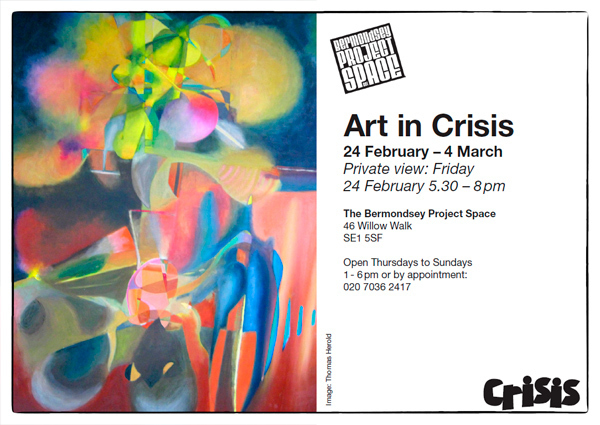 The 'Art in Crisis' exhibition showcases art created by talented Crisis Skylight members - people that have been affected by homelessness, and artists campaigning to raise awareness of issues connected to homelessness. For the first time this special exhibition brings together a wide range of original artworks including paintings, photographs, puppets, and sculptures. Most of the works are for sale and all proceeds go directly to the artist. 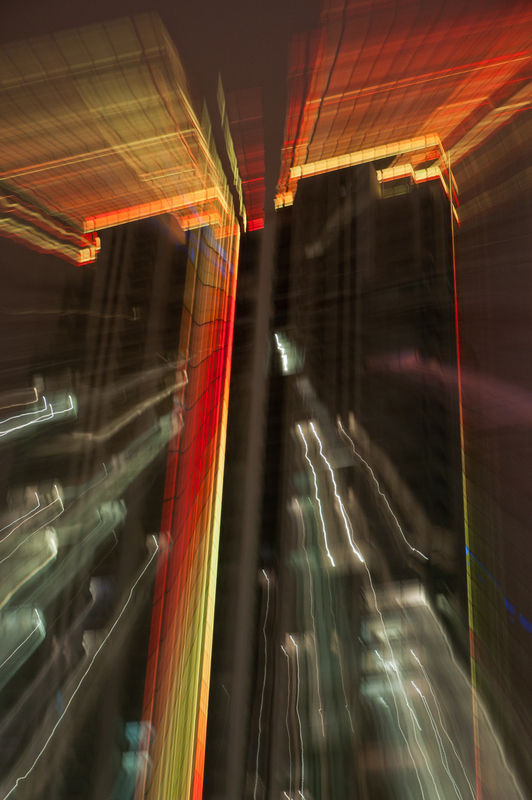 I have 26 photographic images on display taken from my VAA Project, shown recently for the 'Collective Exchange' exhibition at Central Saint Martins College of Art and Design. 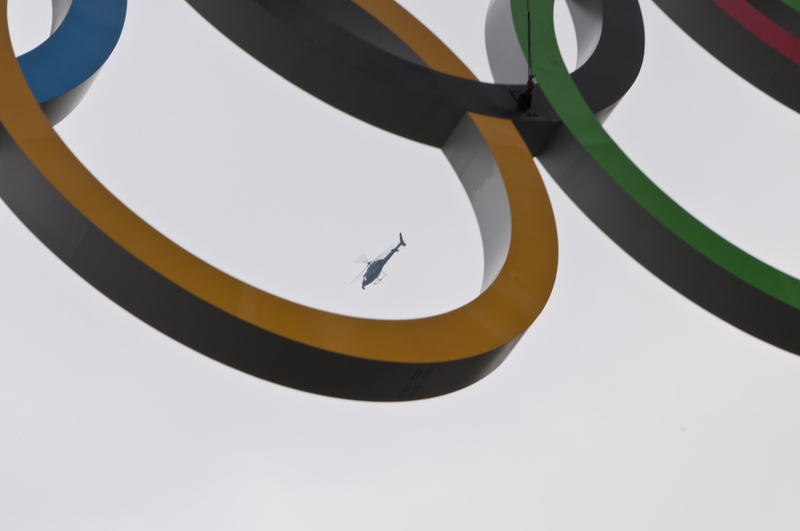 Some of the images appear below, they feature architectural landmarks around London's Canary Wharf, Isle of Dogs, and the London Eye. For many people, these iconic structures represent the boundaries of an impenetrable alien world they find themselves within but not really a part of - the inescapable intangible. Also, long-term Crisis volunteer and photographer Mark Burton is showing a selection of large scale photographic portraits. Mark was given permission to photograph 'Guests and Volunteers' inside the Crisis Rough Sleepers’ Centre in London, which operates over the Christmas period. Situated on the ground floor, the spacious warehouse gallery provides multiple exhibit spaces, a seating area and essential public amenities. There is a flight of stairs leading up to the main entrance. The multi-disciplinary exhibition runs from 24 Feb - 4 Mar, 2012. Admission is free. Bermondsey Project Space (Facebook) - includes map. If you would like to help people affected by homelessness Crisis offers a variety of ways to do it. You can join artists like Ed Sheeran and show your support for the current Crisis campaign 'No One Turned Away' by signing the simple online petition. Every signature makes a difference. 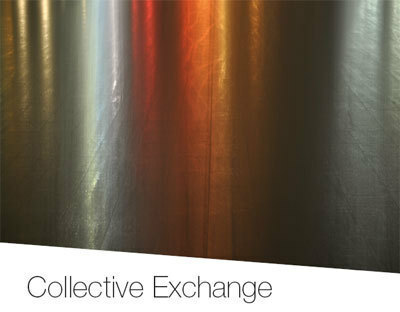 Since October 2011, myself and four other artists have been taking part in a London based collaborative art project called 'Collective Exchange'. Working with University of the Arts London and national homeless charity Crisis Skylight, we have been given an opportunity to develop our critical thinking and artistic practice through the process of researching and developing new artwork. The results of this collaboration form the Collective Exchange Exhibition which goes on view in the entrance gallery at Central Saint Martins Back Hill Site from Friday 10-17 February, 2012 during normal daytime opening hours. The Preview and Artists’ Talks will be held on Thursday 9 February 6-8pm and admission is free on all days. The full address is: Central Saint Martins College of Art and Design, University of the Arts London, 10 Back Hill, London EC1R 5LQ. Special thanks to the following people for their expertise, enthusiasm and continued support. I've created a Slidestaxx presentation for information about the Stop Online Piracy Act (SOPA) and the Protect IP Act (PIPA) in the US. Focusing on the current debate, opposing arguments, security and technical concerns, the package offers a resource toolkit for anyone interested in learning about the issues involved. Featuring content from prominent commentators, online awareness campaigns and a range of Internet protest tools. Links to both Acts are included. Grovo’s Online Music Guide offers a way for viewers to learn how to discover, listen to, buy and share music online. Last week I was invited to Ogilvy's music and brands event ‘Lab Day Live’. I outlined the event in my previous post and here I'd like to mention a little about the success of the day and my observations. Taking place in Ogilvy's Canary Wharf offices in the heart of London's banking and media district, the scene was set in an area symbolic of regeneration and financial strength. Private music festivals are rare in this part of town. For most musicians trying to scrape a living from the troubled music business, the invitation to arrive for work at 9.00am to the grand entrance of a Canary Wharf establishment, must have seemed about as far removed from reality as it gets. Of course musicians are used to playing in wildly exotic locations, quite often removed from reality, so this was not about to faze the Lab Day performers. Subjectively the experience was slightly surreal and possibly what a lucid dream episode of Mad Men might feel like. Imagine 15 bands turning up to play loud sets of music on stages in open plan offices, full of Ogilvy employees, perched merrily if not bemusedly in front of their large Mac monitors. Add to this hundreds of guests wandering from office to office, audio visual crews and equipment, food, drink, live Internet streaming, a cast of 30 music business exhibitors scattered at various locations, and you get the big picture. This took some planning and from my point of view as a guest it all appeared to run pretty smoothly. Although I hear neighbours Barclays bank complained about the noise.That’s impressive! "Look for people who aim for the remarkable, who will not settle for the routine"
The first half of the day was devoted to a series of talks from a range of music industry figures. The 9th floor conference room with it's lofty views over the East End, carpeted in the agency's signature colour red, soon became full and there was a buzz of anticipation in the air. Apart from a few of the long-time music biz professionals I had no idea who all these people were. The multitasking couple sitting next to me were constantly thumbing their respective smartphones and many were vocal in their contributions during moments of audience participation. The talks moved swiftly with panels and individual speakers stating their case for why music is important to brands in the digital age. The audience seemed keen to absorb what was on offer and the speakers were received appreciatively. Here are some of the key issues that were expanded upon with links to further information. I've grouped the 'messages' under general headings and the order in which they are listed flows chronologically to give some sense of timing. A complete list of speakers is available at the Lab Day LIVE website. See Rock’s Backpages for an example of how to build engagement through the curation of music journalism articles. See Ford - Bands In Transit for an example of a brand music campaign. UK music industry revenues fell by 4.8 percent to £3.8bn in 2010, down £189m. See Libspotify for information about Spotify’s API for third party developers, an example of a ubiquitous, freemium, social music application. Firstly this was a direct plea from the music industry for brands to: "Embrace us" and to "consider us in your marketing plans". Clearly B2B and licensing revenues are key growth areas. This includes music in computer games, films and TV. However with brands creating their own digital content the boundaries between brand, record label and publisher are becoming blurred, effectively a brand could be all three. The same applies to games developers. The music industry recognizes this and is inviting brands to partner with music companies that can offer specialised creative services and resources. Key to this strategy is metrics. Advertisers need to pinpoint their target audience and measure the market potential. Until now music has always been a last minute add-on for advertisers, frequently decided upon just days before project completion. Now with the development of Internet music apps and digitized services, music companies can provide valuable data that previously was missing. It's now possible to target the right song for the right demographics. This is a potential game changer. But still it's a complicated scenario and much work will need to be done to make these 'partnerships' realistic. Lets remember artists, writers, management, record labels, and publishers will all have their views on working with brands. Essentially the music industry is diversifying as conventional revenue streams are falling. It's interesting to note the mention of other big areas of revenue such as tourism, considering we're at the end of the festival 'season', now expanded from May to October, and festivals show large growth throughout Europe. Again brands figure strongly in live events. My analogy of a lab rat is apt. During the course of the afternoon I found myself scuttling the Ogilvy warren, in pursuit of the next fix to be found on one of the three stages located in different parts of the building. Given the circumstances, some of the musicians may have felt apprehensive, however on the day all nine of the acts I saw performed well and appeared to enjoy it. These were showcase performances lasting around 30 minutes each. Some of the bands like Wolf Gang rearranged their sets to accommodate the venue, providing a more 'acoustic' style of performance. There was a special intimacy between the artists and audience intensified by the working environment. It’s easy to become a fan when you feel a direct connection to music in this way and I can honestly say I enjoyed every performance. It was a great opportunity to discover new music up close and in the flesh. There are some live audio recordings over at Felt Music on Awdio from acts Digitonal, Kidda, and Wolf Gang. You can also check out the video wall to see what some of the artists had to say about Lab Day. During performances the live stream received 15,000 hits from 86 countries. Live video footage of artists taken from all three stages is available to stream via the Lab Day website (link at top of post). Shortly after watching the final band of the day Tribes, who were great, it was time to leave. In the lift on my way down to earth I had a few moments to reflect on a quite other-worldly experience. On my way I bumped into some of the guys from Boy Mandeville and Digitonal before saying my farewells and venturing into the drizzly world outside. Ah, another day at the office. Canary Wharf won't feel the same for me, for a while, I think. My thanks to the Ogilvy team for a special and enlightening day! Advertising, YouTube and 12 videos to prove the experience - 12 YouTube videos, showing how different brands chose to approach their audience. NYT - With Studio Space, Musicians Get Sneakers - Article about Converse supplying musicians with free studio time in Brooklyn. Putting the Metrics into Music - Examines how to ensure that music becomes a brand asset not a liability. Sound Advice at Ogilvy’s Lab Music Day Live - A blog post about the event from Alex Ririe - Coley Porter Bell. Clem Leek is a musician, composer and sound artist based in the UK. He creates modern classical ambient music which has been released on several independent labels. Clem's works are subtle and dreamlike, using pianos, guitars, ethereal pads, field recordings, and other solo instruments. His SoundCloud stream features beautifully balanced compositions that perfectly compliment those special moments of solitude and creative isolation. These tracks will take you to a calm place and leave you floating in suspended animation.